The Blue Jays are colourful when viewed from behind but this one caught my eye even without the fancy blue wing and tail feathers. S/he almost looks furry. Many thanks for dropping by. Glad you liked the Nuthatch pic yesterday. It's another sunny day here today, the second day in a row, and it sure is a welcome change. Great shot!! She looks well-fed!! and love the bokeh in the back! Very beautiful guy. Very nice focus and DOF. Beautiful capture. I think it's fluffed up because of the cold. Great DOF. You get such lovely focus on these shots, no exception here. May sound silly but they don't get a winter coat of features do they? Or perhaps they just ruffle them up to keep warm. Wonderful capture. Superb shot - such a great close-up. Oh yeah, love his 'do, that's a great close-up! Excellent detail in this one Anne. Such beautiful color. He looks so fluffy--very nicely captured. Wow, what a great capture. Excellent. They are pretty to be such mean little boogers...fav! Stunning shot, the colour and detail are amazing. Fave for me! Love the way those top feathers are sticking up! I FAVed this one. I love the softness of the feathers, the blue,the exquisite detail and the great timing in catching the seed in his beak. Great focus and he's so fluffy! Beautiful bird. Beautiful bird! I wonder if I might spin some yarn from his soft fluff? Wouldn't that be wonderful! Beautiful shot- so soft and warm looking. He looks all fluffy and warm. Awesome, fantastic shot. Oh my I would almost sell my soul to the devil to get a shot like this....LOL! Just look at that fluff and colors. Wow...fav! great shot, yet again, anne. fantastic details, texture and colours. bravo! First I liked the soft blue crest, then the booked, and finally saw the seed in beak! Fav ! This is wonderful! What a beautiful shot of this pretty one!!!! Your bird photos always amaze me, but this one was an instant fave! 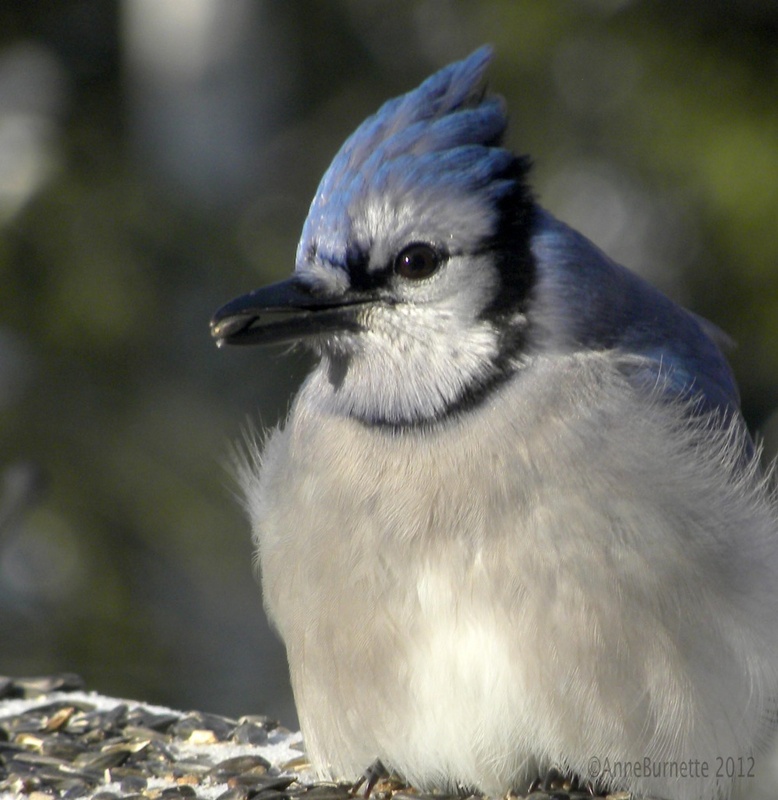 I've been stalking Blue Jays for a while and never captured more than a quick blurr. Awesome shot, Anne! Excellent! This is a great close up and like to see that blue notch! Wow, what a close-up, fabulous!!! Wonderful capture, just so much detail and such a great close up! I love his little mohawk, Anne! Wonderful shot! what a great close-up.....great capture, Anne! Beautiful capture Anne, congrats on the PP! Such a great shot Anne, great clarity.... wonderful color!! congrats on the PP well deserved! !